For the domesticated dog, play is the key to physical and psychological health. It allows them to perform innate actions—stalk and hunt, run and tear, comfort and cuddle. One of the five freedoms of animal welfare is the “freedom to express normal behavior.” With guidance from animal behaviorists and veterinarians, we sifted through the vast marketplace of dog toys to find the best for your pup’s preferred style of play—fetching, chewing, tugging, or riddling out a treat. When a toy’s function meshes with the innate action it’s simulating — like chasing, chewing, or tugging — it prompts mental stimulation as well as physical activity. By providing dogs with a focus, an object for their excess energy, toys also discourage negative behaviors, like digging up the tulip bulbs or chewing on sneakers. We sought out toys designed to sustain your dog’s interest in their favorite play behavior, whether it’s a fun toy to chase or something endlessly chewable. We gave priority to products with high customer reviews that indicate they’ve been well-tested (and well-loved) by a lot of dogs. What goes in your dog’s mouth should be safe and toxin-free. While no federal agency regulates pet toys, some manufacturers go out of their way to meet material safety standards. 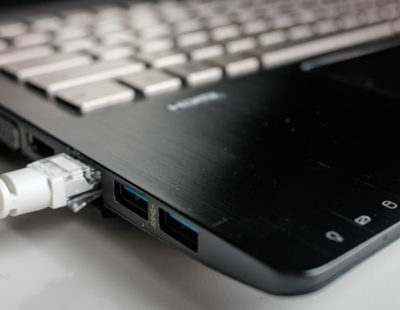 Many individual companies acquire third-party testing to verify that their products don’t contain harmful levels of lead, phthalates, and other worrisome chemicals. 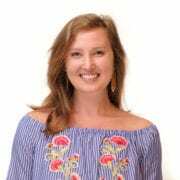 We curated a list of promising brands from wellness-conscious dog resources like Pet Business, The Bark, Pet Sustainability Coalition, and Preventative Vet, then followed up with the manufacturers highlighted by those organizations to verify their safety measures. We compared the favorite fetch, chew, tug, and interactive (typically treat-delivering) toys from our preferred brands. 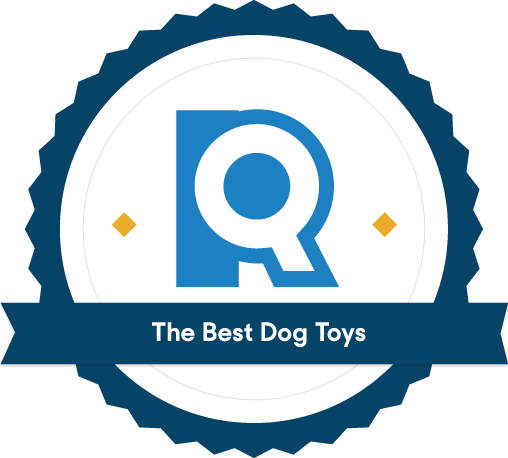 We wanted toys that real dog owners reported as being a hit with their pups because a toy is really only as good as the play it inspires. We compiled bestsellers and best-rated picks from Amazon and Chewy and combed through customer reviews to find toys that keep dogs interested and stand up to roughhousing. Even the most popular toys can have issues from time to time, though, so we also checked on return policies. While almost every company we considered offers replacements, we gave bonus points to those that make it easy to return their products, with generous timespan requirements and on-site forms. Your doggo’s toys should be appropriate to their current size. Small toys are easily swallowed and can get lodged in your dog’s throat, while oversized toys are impossible to get a good, teeth-safe grip on. We gave preference to toys that are available in a number of sizes so you can get one well-suited to your sidekick’s size. A molded, erratically bouncing ball, that comes in three sizes and fits in ball launchers. Some dogs, like terriers, were bred to hunt. This heritage gives them an innate desire to chase and capture. Anything darting by at a good clip, be it squirrel or cat or car lights reflected on the wall, can trigger the instinct. But anything worth chasing does more than land and lie still. West Paw Zogoflex Jive has sculpted cutouts that cause it to bounce and roll in surprising directions. There’s discs and frisbees, but the old tennis ball is an iconic dog favorite. However, a 2017 study revealed 48% of pet tennis balls tested contained lead, a known human carcinogen. Zogoflex Jive is roughly the size and color family (three shades of neon) of tennis balls, but is made with natural, recyclable materials, and is blessedly lead-free. A somewhat heavy ball makes for stronger, farther throws. And if your arm gets tired, try using a launching device. Long, fast throws help stretch the legs of athletic breeds, and the Zogoflex Jive is made to fit most launchers. While most balls with the heft you need for a good lob are also hard, the Zogoflex Jive is a softer (but still guaranteed durable) option. The squelchier rubber surface also makes it easier for dogs to get a good gnaw on their prey as they carry it back to you. Kong Extreme Ball - With Kong’s patented uber-rubber, the Extreme Ball is a better fetch option for dogs that tend to seek-and-destroy. West Paw Echo Zwig - If your pup tends to ignore balls and haul branches back to you, this fun, bendy stick-like fetch toy could be a better pick. Planet Dog Orbee-Tuff Squeak - Some dogs live for the squeak—it’s the sound of active prey. Here’s a vocal fetch alternative to the classic ball. The king of durable, all-natural rubber toys can survive power chewers and give them a treat for their labor, too. High-quality rubber is perfect for aggressive chewers with strong biting instincts. Kong delivers some of the toughest rubber on the dog toy market and calibrates its strength to suit various chewing styles. If you have a power chewer on your hands, upgrade to the Kong Extreme. But for most dogs, the Kong Classic provides more than enough resistance, promoting healthy chewing behaviors while helping dogs scrape plaque from their teeth. Offering the right size of toy for your dog is important across every toy category, but it is especially important for chewing toys. They should be large enough to encourage chewing from the side rather than up and down (that kind of direct pressure can be damaging to dogs’ teeth), but small enough that your dog can carry it around with ease. The classic Kong comes in six sizes — XS, S, M, L, XL, XXL — offering something for ankle biters and big-mouth pit bulls alike. Chew toys provide a diversion, a heck of a masticating workout, and promote dental hygiene. The Kong Classic extends this list: It’s also a fun fetch toy with an ear-plug-like shape that bounces in unpredictable directions when thrown. Its hollow interior is also perfect for hiding treats or a dollop of peanut butter. 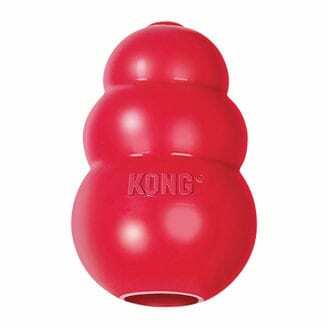 Kong Extreme Ball - If you have a power chewer, you know it. The Kong Classic provides enough durability to stand up to most chompers, but level up to the Extreme if you are used to seeing toys destroyed in seconds flat. 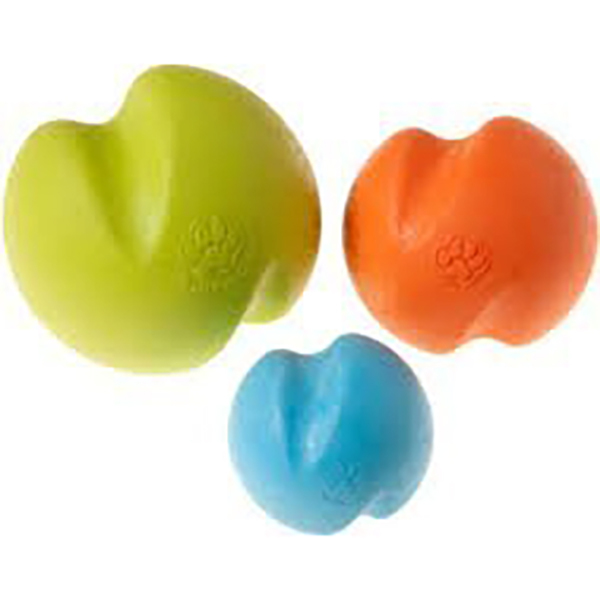 West Paw Zogoflex Tux - A shapely alternative to the Kong, this treat-dispensing option has three knobs to keep your dog gnawing. Nylabone DuraChew Bacon Flavor - For a safer spin on the bone your dog is instinctively craving, try this bacon-infused chew toy. Bonus: it features raised bristles to scrape teeth clean. 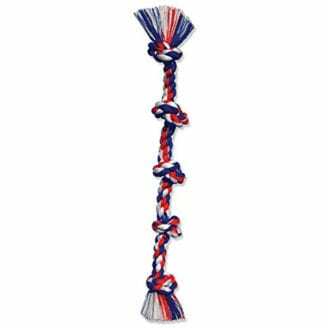 The braided cotton of this sturdy tug toy delivers interactive playtime while flossing your pup’s teeth. If you like playing tug-of-war with your pup, you should have a single designated tug toy. This keeps tugging from being an acceptable play behavior with whatever toy, shoe, scarf, or Thanksgiving turkey you happen to be holding. According to Todd, “Ropes are great toys for dogs that love to play tug (be sure to let them win often! )” Mammoth Cottonblend is perfect because the lengthy design is tug-specific, and keeps hands clear of your dog’s chompers. Woven cotton rope makes for a strong tug toy that’s non-toxic and can also help clean their mouth as the rope fibers essentially floss during chewing. While there are dental benefits to tugging, keep in mind it can be overly strenuous for the teeth of puppies and senior dogs. One size never fits all when it comes to dog toys. Mammoth Cottonblend comes as a three-knot rope (available in five sizes) and a five-knot rope (available in two sizes) — so you’re always the right distance away from your canine’s canines. Mammoth Cottonblend 3 Knot - Smaller dogs want to tug, too. The 3 Knot is available in five sizes, starting at just 10 inches, so you can fine tune your pup’s tug toy to their size. West Paw Zogoflex Bumi - The S-shaped design of this tug toy provides safe spots for your hands and their mouth, a nice change-up from yanking on rope. Kong Floppy Knots - Tug toys simulate the joy of the kill, and these rope-made critters provide a realistic mouth feel that your doggo will enjoy wrestling with, whether he’s playing with you or alone. This toy combines tricks and treats to keep clever dogs occupied. Dogs are happiest when they solve a problem and then get a food reward—happier than they would be with just the solution or just the treat. The researchers who discovered this call the ultimate treat a dog’s eureka moment. Dogs crave this kind of intellectual stimulation, and that’s where food delivery toys come in. Nina Ottosson is a design pioneer in this category. If you have a pup who gets bored or anxious when they aren’t getting human attention, or tears up toilet paper if left to their own devices, chances are they are in need of a more productive outlet for their mental energy. The Dog Brick features hinged and sliding pieces that need to be maneuvered with nose and paw to reveal treats tucked into its compartments. Customer reviewers say their dogs love solving the puzzle and prefer to have their food delivered to them via the Dog Brick than in their bowl. A new toy, especially a new and challenging toy, will always focus and occupy a dog’s attention. Prolong their interest and stimulation by upping the difficulty level of the Dog Brick. Let them take a first shot at the toy with not all the bricks in place, then up the difficulty by including more pieces and swapping. Starmark Treat Dispensing Pickle - Not all interactive toys need to contain a lot of small pieces. The gash in this football-shaped toy creates a pocket for treats that your pup will fixate on retrieving. West Paw Quizl - The bendy, hourglass profile of the Quizl can hold long, thin treats in addition to smaller ones, perfect for pups who yearn for bully sticks. Kong Stuff a Ball - For power chewers who enjoy the chase, this bouncing ball features slits and openings that shake out treats with enough play. Dogs need play and humans enjoy playing with dogs—it’s not clear which came first in the process of domestication. Either way, play is a central part of dogs’ positive welfare. When you see puppies scuffle, you’re seeing social cohesion being built between dogs. When you play with your dog, the same cohesion is at work. Cooperative relationships between and across species are strengthened by play. Before leaving your dog alone with new toy types, know what he is most likely to do with them. Some dogs play gently, or bore of a single pursuit quickly, while others go into seek-and-destroy mode, disemboweling fluffy critters and seeking the noisy heart of a squeak toy. Since most toys become choking hazards if sufficiently torn apart, being aware of your dog’s characteristic response will help you decide whether certain toys are safe for them, or if you should simply leave them with a sturdy Kong. Offer a rotating group of four or five toys that hit all your dog’s play behaviors—tugging, chewing, “killing,” and carrying. Dogs love novelty but you can fake new toys by having your pup discover oldies but goodies around the house and yard. Giving a toy a new scent by washing it in the washing machine, rolling it in the grass, or storing it in the herb cupboard—any of the above will up its appeal. Above all else, if you seem excited about a toy, he will be too—he mostly wants to play with you. Comfort toys are plush items that your dogs soothe themselves with by carrying around and babying. Comfort toys should be left out at all times. This is a toy your dog has bonded with and probably likes to sleep with. The best comfort toy will be small enough to carry, and maybe analogous in size to your dog breed’s prey (rabbit, duck, mouse), as some dogs like to shake and “kill” their soft toys. Just keep in mind most comfort toys generally aren’t good for power chewers. Many pups guzzle their food down at an alarming rate, leading to an unsatisfying meal or, worse, a bad case of indigestion. 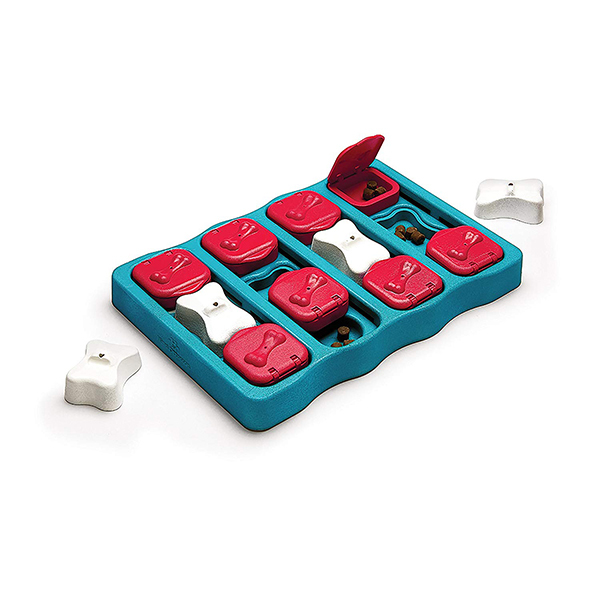 An interactive feeding toy slows them down, creating pauses between bites as they quiz out their next morsel of food. You won’t see their dinner spat back up on the floor, and they’ll derive more pleasure from their food. Even well-made, durable toys may eventually succumb to wear and tear. Regardless of your dog’s chewing prowess, regularly inspect any stuffed toys to look for damage to lightly stitched seams, as well as loose, hanging pieces that might fall off and be eaten. If well-loved toys are getting torn apart, it’s time to discard. Examine any new toys and remove dangling strings or loosely attached decoration before your dog has a chance to gnaw them off and ingest them. What about a good old-fashioned stick? Dogs love gnawing and fetching things like sticks and pinecones. The allure to your pup of playing with these natural materials, covered in intriguing outdoor scents, should be weighed against the danger of mouth wounds and choking on chunks that get gnawed off. The solution? Keep an eye on your dog while they’re playing with natural materials and don’t leave your dog with them unsupervised. What about a good old-fashioned bone? Natural bones provide hours of gnawing entertainment as well as a nutritional benefit from its soft tissue—the meat, cartilage, fat, and connective tissue that are still on a dried bone. If you aren’t keen on an animal bone on the carpet, dogs also get a lot of satisfaction (and a good teeth scrub) from Nylabones and dental bones. If you do opt for the natural route, be aware there’s some danger of chipping teeth or choking on large bits of broken bone. Go for a walk — Be part of the 60% of dog owners who walk their dogs. The physical exercise component is obvious, but don’t discount the value of sniffing time and the opportunity to socialize with both humans and other canines. Take them for a swim — Swimming isn’t as universally loved by dogs as walking and running is, but for many breeds it’s exceptionally appealing. Labs even choose to swim over hanging out with other dogs. Schedule dog playdates — Dogs are social. Evolutionarily pack animals, dogs still love to meet and greet their fellow canines and exercise their instincts in a way they just can’t with their human family. Caveat: Not all dogs like other dogs. In that case, off-leash outdoor time with you is still important. Challenge their nose — Sniffing is a dog’s greatest tool while on the hunt. Give your pupper an opportunity to do what they’re naturally good at with nosework. You can go official with training classes or just play some simple games, like hiding a treat in one of two closed fists and having your pup ferret out the right one. What are the best dog toys by breed? Companion Dogs — These dog breeds are typically (but not exclusively) small, pretty pups—think bichon frise, pug, pekingese, pomeranian. 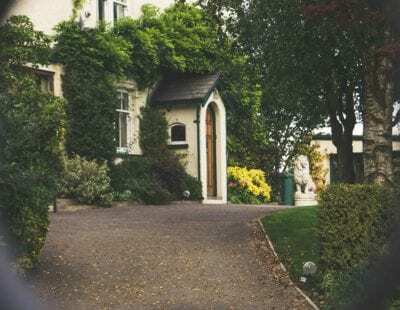 They have historically been prized for the pleasure of their company over any utility, and they can get anxious if left alone. Interactive toys are best, as well as soft toys that keep them company when you’re away. Working and Herding Dogs — Workers like shepherds and collies are intelligent, confident dogs. They put their smarts to use on K-9 police and search and rescue teams. Exercise their physicality and their brains with treat-dispensing games and gnaw-proof rubber toys like Kongs. They are also particularly interested in playing fetch and will have the stamina to play it for much longer than others. We love finding great products for your furry family members and take pride in holding them to high standards for safety, efficacy, and value.